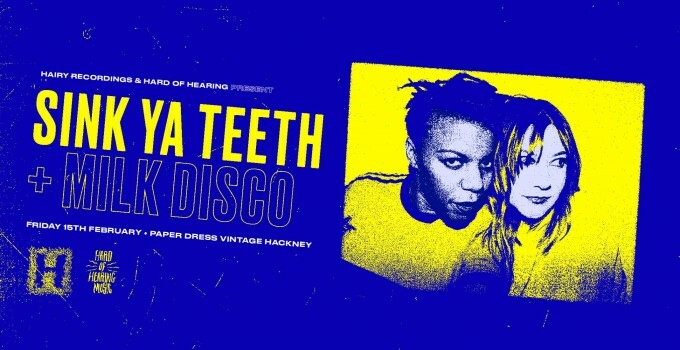 Hairy x HOH present: Sink Ya Teeth + Milk Disco // All Souled Out! Join us on Friday 15 Feb for an evening of live music followed by new club night All Souled Out till 3am! Norwich post-punk/ dance duo Sink Ya Teeth have had quite the 2018. Relentless touring off the back of their stellar debut record, has seen them feature heavily on anyone who’s anyone’s end of year album lists including a nod for best record by 6music’s Amy Lamé. Sharing stages with Gang Of Four, Hookworms and Confidence Man along the way. A throbbing strut underpins the London quartet’s sound, part contorted dance-floor filler, part groove-ridden exorcism, and in their element live. Carving a niche for themselves within London by throwing their own parties entitled ‘Welcome To The Milk Disco’, 2019 looks as sharp as hell. Plus All Souled Out club night with Perri Kaye till 3am!